Steve Maxwell is one of the world’s most accomplished and well-regarded health and fitness experts – in addition to being a fitness coach, physical educator, Brazilian Jiu-jitsu instructor, trainer to high-level professional athletes in the MLB and the NFL, and consultant to various US government agencies such as the DEA, the Secret Service, and the FBI, Steve has been named one of the Top 100 trainers in the United States by Men’s Journal and holds a number of Pan-American and Worldwide Championships in competitive grappling. Steve has been featured in many mainstream and industry-specific outlets, such as Men’s Health, Muscle Media, Hard Style, The Russian Kettlebell Challenge, and The Naked Warrior. 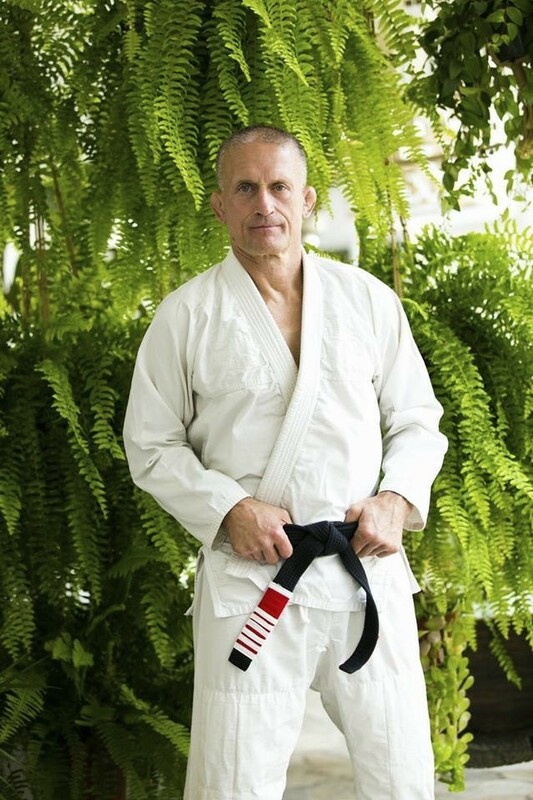 Today, Steve continues his nomadic lifestyle, traveling around the world and sharing his insights and wisdom through his seminars and training camps. This is my third interview with Steve, so if this is your first time hearing him, make sure you check out his previous appearances on Corporate Warrior! QUESTION OF THE DAY: How have you tried to adjust and optimize your training routine throughout the years in response to the effects of growing older? Please let me know in the comments at the bottom of this post. Wow, that was a long haul…..would’ve been a lot shorter if Steve had left out the mega levels of woo! (I’ll DM you on Instagram re those rather than befoul your comments section though). Steve is just perfect to listen to when he sticks to exercise but the other stuff is painful listening. Other comments though: Lawrence, if you’re eating a potato every day you’re not doing “zero carb” this is why I have such a problem with this N=many thing, it’s totally uncontrolled. When I was a teenager I did a martial art called Hapkido, there’s a class in Ennis I see online http://irelandhapkido.com/ it’s a very comprehensive art and a little out of the ordinary which is nice. Oh, one thing that made me smile was, like Steve I am an enthusiastic eater of bones, get yourself a stock pot! Also just watched the London Real hotel video. Seriously some of the most ridiculous stuff I’ve ever seen! Hey Andrew – I appreciate your point regarding the woo and understand where you’re coming from. I’m skeptical, but if it works for Steve, then fair play to him. I think there may be some value in it, especially the skin brushing? But I need to look into it more. Lol. I know what Zero Carb is Andrew 😛 and I I know I don’t do Zero Carb. I’m low carb – I love a cheeky potato or some rice in the evening. I just said I’m interesting in the movement and if it is or isn’t potentially a superior way of eating to other diets. N=many is not controlled and self-reporting so I hear what you’re saying but it’s better than nothing? And a good start? Maybe some of the results from the N=many will trigger RCTs? Great interview, Lawrence! I am picking up the book, The Oxygen Advantage, that Steve referenced. If anyone out there is intrigued by Steve’s comments on improving his eyesight, there is a website call endmyopia.org that explains it all and can show anyone how to improve eyesight and eventually eliminate dependence on eyeglasses. Hey Matt – glad you enjoyed it, and thanks for the feedback. It certainly was something different! (Steve’s routine ????????) haven’t looked into the eyesight stuff too bad. Well designed studies probably don’t exist (as Steve has said) but if they do, please point them out ????. They aren’t well designed studies, for a variety of reasons. It can be shown that excessive near work (such as 10+ hours per day of looking at screens) in contrast to our evolutionary history causes a spasm which can induce myopia (search on google scholar for “near induced transient myopia” / “pseudo myopia” or “ciliary myopia”) AND that use of distance lenses for near work causes myopia to increase (search on google scholar for “hyperopic defocus”), but it’s an inductive leap to reverse engineer what research there is into a process whereby anyone can eliminate the need for eyeglasses. What you end up with is more of an n = many type of situation. If you think that people think you’re nuts when you tell them that they only NEED to train once per week to get most of the strength gains their genetics will allow, it’s nothing compared to trying to convince people that nearsightedness isn’t purely genetic and that it can be reversed. Way off topic in terms of HIT, but I can’t help but share when the opportunity arises! Appreciate your sharing your view on this Matt. Very interesting indeed! Glad to share! I’m continually impressed at the breadth of subjects that come up and listening to podcasts. Hopefully, it’s to all of our benefit! Appreciate your view Andrew. Where I disagree is I think that for Steve – he thinks it works and it takes him ~15min per day so he doesn’t mind. I don’t currently do it myself (even though I committed on the show), but I’ve taken some bits away to think about and research. Re N=many – I see what you mean re N=Many being based on self reporting which could be influenced by cognitive bias etc, but I am treating as an N=1 with no expectation of a results (100 push-ups per day and a 5min cold shower everyday). I tracked my weight and waist circumference at the beginning and will measure at the end. So there is value in it for me at the very least, and the same is for anyone who wants to do N=1. “Magical thinking” doesn’t make something real no matter what the practitioner believes but it’s a dangerous mindset to. be in, accepting nonsense as real erodes the perception of reality. Massaging your ears for whatever imaginary benefit might not hurt anyone but using homeopathy or to treat serious diseases and all kinds of nonsense is in exactly the same mindset. Fair play on the N=1 side of things, I did one recently myself with mixed results. Nice one Will! Will check it out. Thanks for contribution. Hey Lawerence here’s a pdf copy of Fat of The Land by Vilhjalmur Stefansson someone put online. I actually have a hard copy, it’s amazing book, it covers much more than just his own time with the Inuits, but since it’s rare, the actual books are expensive. So he and a former member of his team spent a whole year being examined by the doctors and all they did was thrive. And later, he went back to following it to his death ,and so did his wife. Nicely put James. I agree with much of the above, and you seem to have a rationale approach to this stuff. Thanks Lawerence i appreciate that. I always try to ideally think of that quote that Bruce Lee made popular,“Adapt what is useful, reject what is useless, and add what is specifically your own.” Even to people i dislike, or disagree with a majority of the time, in all aspects of life, like work etc. Easier said than done sometimes, but the fact is if they’re good at something in particular i ideally keep that aspect in mind. I figure i don’t have to hang out with them ha ha. But i’ve noticed most people if they dislike someone, for what ever reason, that’s that, no matter if they could benefit in some way themselves. And of course the other big negative with human nature in general, a lot of people are more concerned about having their beliefs challenged, that they could be handed a solution in their lap, for you name it ,but they refuse to even attempt it because it challenges their belief system. The thing is the despite the woo I actually really like Steve, he’s an affable guy and really inspiring otherwise when it comes to training he’s just top notch. Personally I have very few actual beliefs, I don’t mind being challenged and even proven wrong. I’ve definitely lived by that Lee quote in exercise without really knowing it, I believe I’m learning, discarding and adapting every day. Also the greatest thing happened, I literally DID have the solution handed to me in HIT and Lawrence has provided me with a gold mine of information here….I’m just more likely to be buying a “forearm forklift” than an appointment at my local “Rolfer”. Touché! And appreciate the compliment. It’s awesome to know that my show/blog attracts very smart and critical people. Completely agree. Love that Bruce Lee quote. Used it to wrap up a recent episode. This is exactly the perspective I try and take now. The West, where all of modern medicine was developed, saved millions of lives and continues to advance with proven scientific techniques. You’ll notice that “ear yoga” for instance hasn’t cured all deafness in India if you don’t mind me putting up a little straw man for you to knock down. And the financial gain thing? Pharmaceutical/supplement/fitness/lifestyle companies could potentially make millions if they could prove some of these quack methods really worked. Here’s a quote from Ryan Hall from this very podcast series “In science we are not interested in subjective measurements, only objective ones”.